Don’t worry, I won’t write the whole post in French! I feel as though I’ve died and gone to heaven-even if it is in France. It’s not everyday that one has such an extraordinary day though maybe when you live in Paris it is de rigueur. Even after a mere two days it is easy to pickup the language and idiosyncrasies of the French people. My Canadian friend Gerald who lives here still manages to be amazed and confounded by the French. French dining is something I could get especially used to. Tonight we have dined (and I mean dined!) 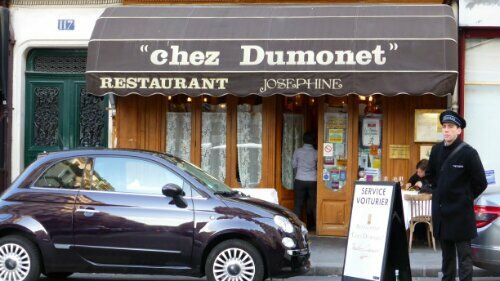 at a restaurant called Chez Jospephine Dumonet. I’m not sure about the name because it is different on the internet and at the restaurant and even on the receipt. 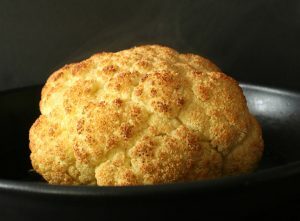 I found the restaurant on several websites during my pre-Paris planning. On every site, it had raving reviews about it being a very good ‘classic’ French restaurant so I asked my friend Gerald to book us a table for Friday. In Paris, you must book reservations in order to not be disappointed upon arrival because many of the best are often also extremely tiny. After we arrived from the metro, my family went inside while I stopped to take a photo. Then I saw that Gerald had arrived and we greeted each other and also entered the restaurant. I didn’t see my family inside so I knew something was wrong. It turned out Gerald and I had walked into the wrong restaurant. Of course they asked if we had a reservation and we said yes ‘pour Gerald’. They looked confused and said ‘pour Gerard Depardieu?’ Then we were all confused! Eventually we figured out Chez J.D. was next door. I’m still wondering if Gerard Depardieu ever showed up!! After we were seated we met Gerald’s partner, Maria and were treated to a glass of white wine. 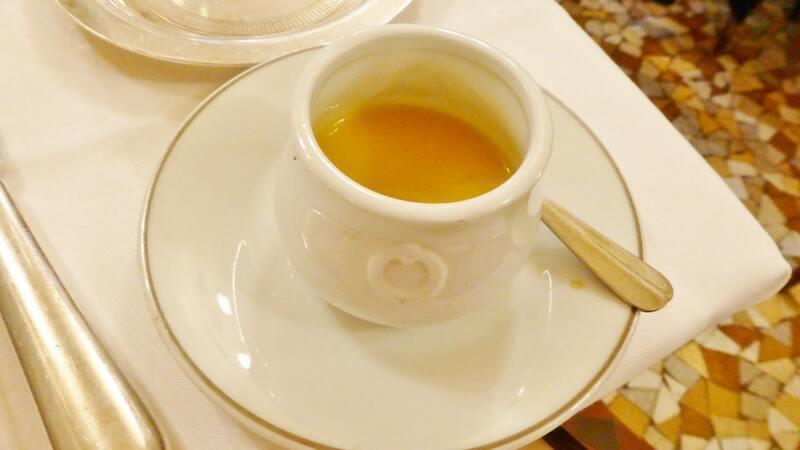 Almost immediately, the waiter set down a small pot of soup, our amuse bouche. It was a nice little potato soup. 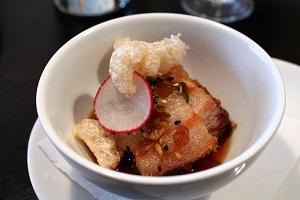 Just to enough to get our taste buds warmed up while we were deciding what to order our entrees and mains. The waiter explained that many of the deserts took a long time to make so we also ordered three deserts even though we didn’t know if we would have room. I had originally really wanted to try the stuffed morels and langoustines but they were out of both so we settled on two orders of fois gras and two orders of crispy prawns instead. It was to be our family’s first taste of fois gras. Both hubby and kid number one love liver pate so I was sure they would like it. Kid number two is quite picky but willing to try things at least once so she had a bit on the baguette and that was it. There were two thick slabs on the plate and fois gras is extremely rich so I was worried we wouldn’t finish it. 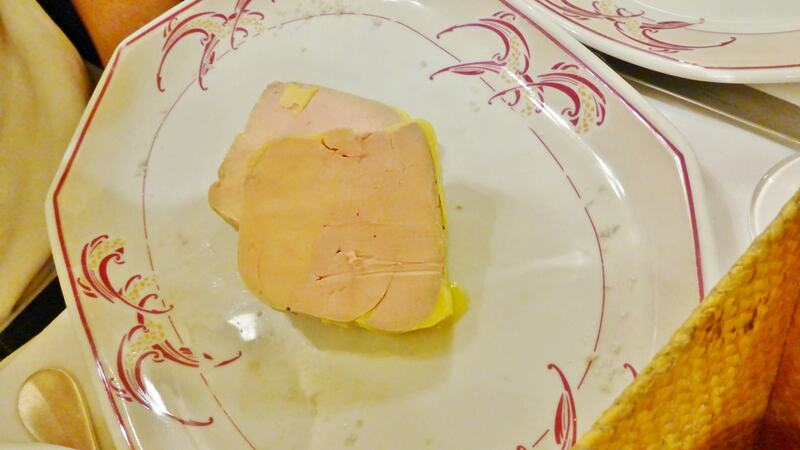 The fois gras had a very smooth texture with a slightly smokey, ‘ducky’ taste. A bit wild and oh so naughty! We finished our first basket of baguette and asked for more so we could finish off the fois gras. The crispy prawns were also really delicious. Plump, juicy prawns and a crispy coating with a delicious balsamic glaze. They were very moreish. 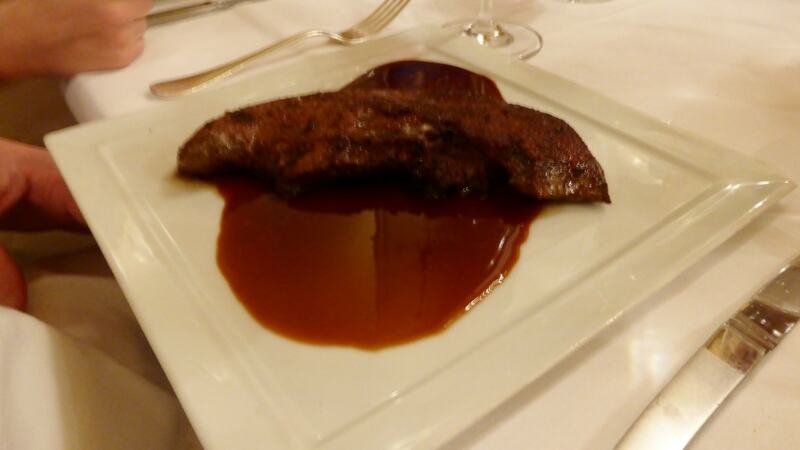 Our friend Gerald was a little more adventurous than the rest of us and ordered the calf liver. I had to have a taste of the dark, glossy sauce and I thought it was quite nice with a small hint of raspberries. Just enough for the flavour and not overpowering. This photo is terrible but it’s all I have….apologies! Maria and I both decided on the confit duck. Apparently she is an ‘expert’ on duck as she orders it almost every time she goes out and so has had it at many different restaurants. It was my first time, however, and I really enjoyed it. 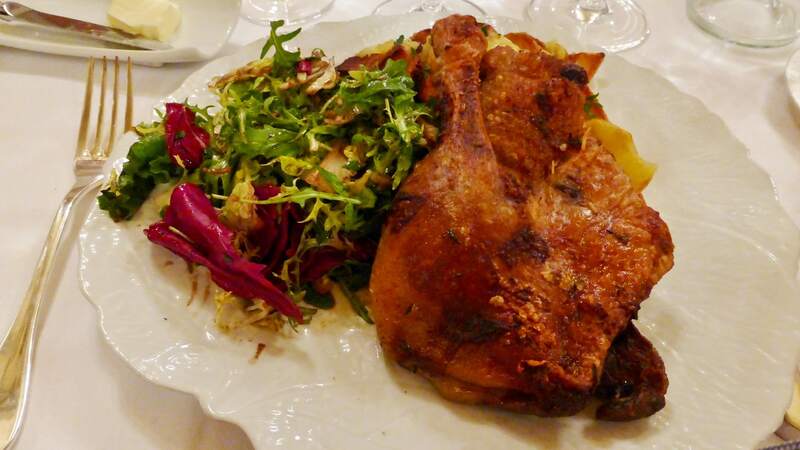 The skin was crispy and delicious but the duck remained very moist and and flavourful. There were crispy side potatoes and a nice salad accompanying the duck. Apparently Gerald’s favourite thing to order out is tartare but he couldn’t convince us to order it tonight. I did manage to take a video of the waiter preparing it table side for the table next to us. He put on quite a show. I’ll try to post it on a separate blog post. 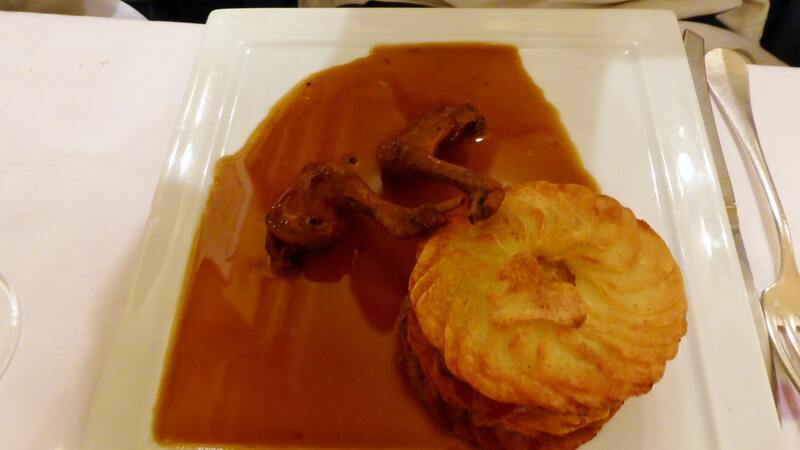 Hubby had the Mille Feuille Pigeon. It really wasn’t what I was expecting at all. I was pleasantly surprised to see the ‘mille feuille’ were actually two potato gallettes. In between, the tiny pieces of pigeon were small and tender, cooked a medium rare which is traditional for pigeon. 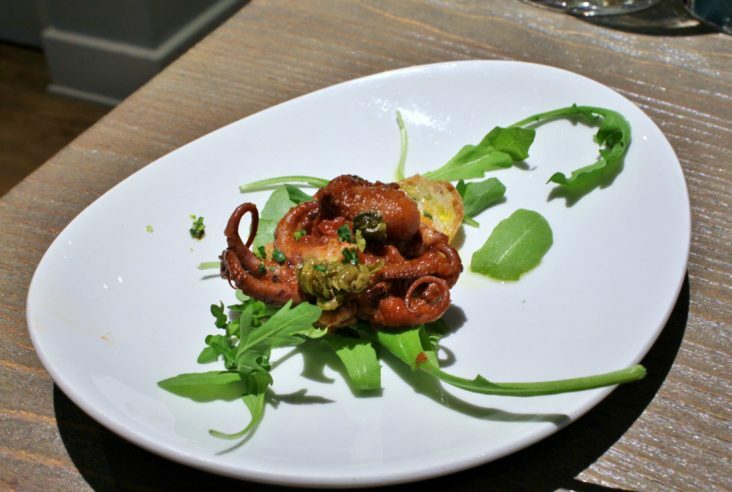 Also, for some reason I don’t understand, presentation of this sort of dish always includes the legs lying there on the plate. It’s not something I find attractive, but again it is French tradition. 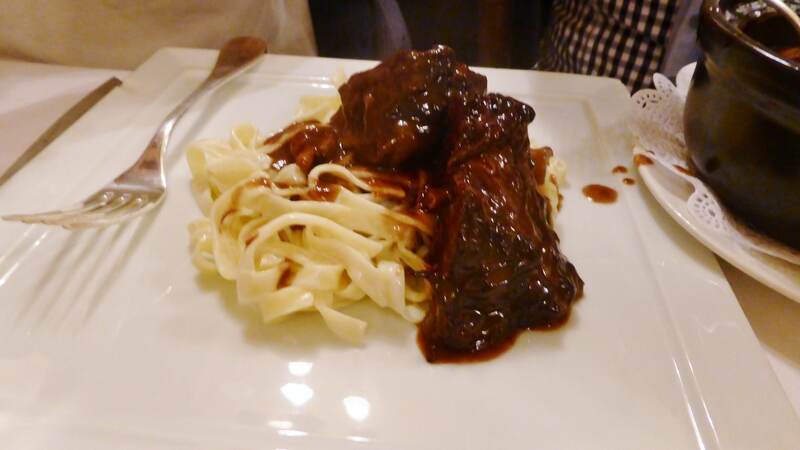 Both of our kids were content with ordering the Boeuf Bourginon which came with fresh taglatelle. If you have ever made Boeuf Bourginon, you know it’s a really complicated way of making a beef stew. It is a long process and a lot of work, but the end result is something spectacular. The beef just melted in your mouth and the flavour was so rich. Of course the French are master sauciers so the dish must have been finished with great amounts of butter. Kid number one finished his full portion and then ate some of his sister’s. I sure don’t know where he puts it, then again I had bought him some new pairs of pants about a month before the trip and already they are short. He is 12 and in an intense growth phase. Do you think we had room for desert after all that rich food? Just barely! Good thing we had ordered three to share among the six at our table. One of the deserts we were happy to order was Fondant au Chocolat with ice cream. 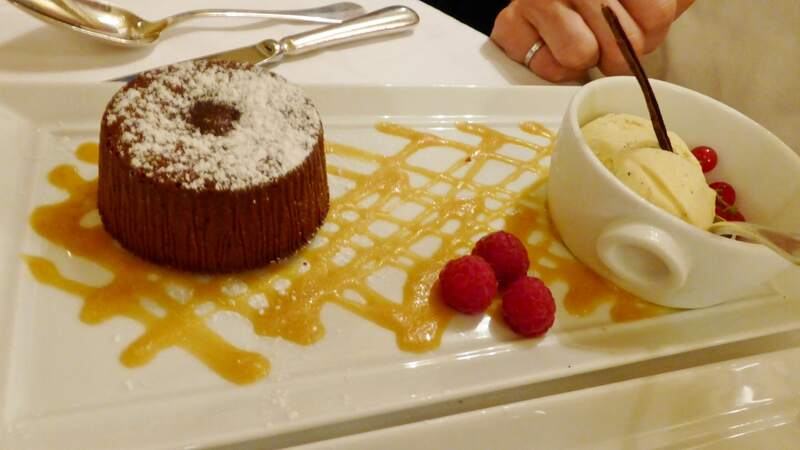 This fondant was perfect, just barely cooked so that when you cut it with your spoon it oozed all over the plate. Delicious! 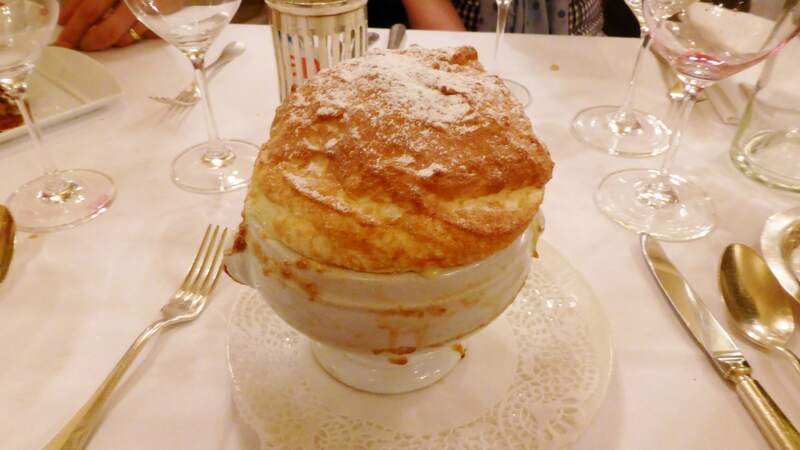 One of the dishes I just to try here was the Grand Marnier Souffle. It’s not very often that restaurants have this on the menu and I didn’t want to pass up the opportunity to try it. I think it may have been a bit ‘eggy’ but the Grand Marnier was a nice hit and it was especially strong on the crusty top bit. 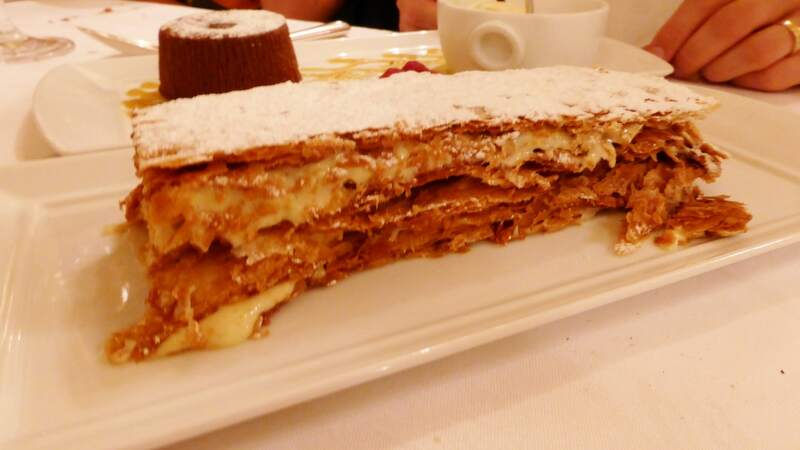 And last but not least, the true Mille Feuille. Layered crispy sweet pastry with creme patissiere. It was the star of the deserts and six forks fought quite a battle to the end. What a feast! 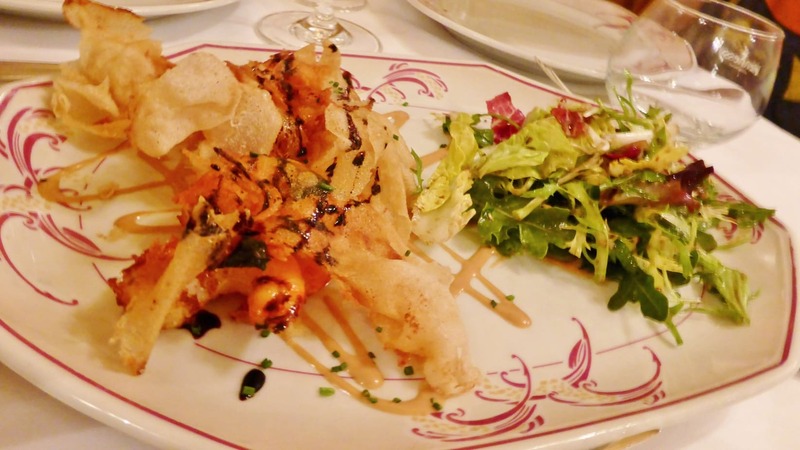 I love how the French take hours to enjoy a multi course menu, with great wine and better friends….why wouldn’t they? Oh-My-God! This is gorgeous food! Yes it was…now I’m feeling somewhat inferior. How do I follow such posts? That duck confit and beef bourguignon were top notch!